Three teenage boys have been arrested after a man was stabbed in supermarket car park in a "targeted" attack. 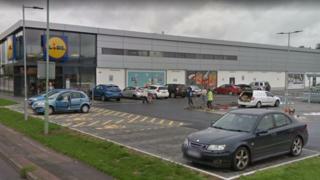 The 18-year-old was sitting in a car next to Lidl, in Haverhill, Suffolk, when he was stabbed several times in his upper arm and leg. He was taken to hospital after the attack at about 19:20 GMT on Sunday, and has now been discharged. Three boys from the town, aged 13, 15 and 17, were arrested on suspicion of assault causing grievous bodily harm. They were detained about 45 minutes after the attack by police who are treating it as a "targeted assault". The three remain at Suffolk Police's Bury St Edmunds investigation centre for questioning.